A mattress' padding provides the comfort. High-end mattresses use exotic and comfortable materials like silk, wool, cashmere, premium foams and latex. At the cheaper end, materials include lower grades of foam and reclaimed cotton fibres. Spring: Standard inner-spring mattresses comprise of a core of metal springs covered by foam and padding. The springs (also called coils) are the part of the mattress that support you and determine the mattress' lifespan. This depends on the amount of springs, their shape, thickness, the way they're arranged and the number of turns in the springs. Air:These mattresses use air chambers instead of springs for support. 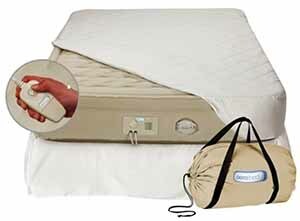 Some air beds can even adjust the firmness of the mattress. If you're buying a mattress that you'll be sleeping on with a partner, test it out with them. A good mattress should prevent you from rolling into each other.